ALL classes will be indoors starting on 11/1/16 and will stay inside until the spring; if class is cancelled, you will receive a text or email or check Facebook. Lose Weight, Tone Up, and Make Friends! Carolyn’s BOOTCAMP classes will wake up your metabolism. 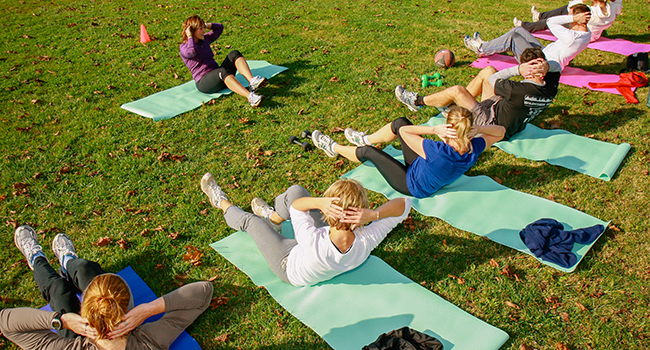 Your body will burn fat during and after your BOOTCAMP experience. This fun but intense workout is designed to reshape your body. Get your body in better condition with Carolyn’s BOOTCAMP! Fit-Boxing is a FUN, energetic workout! Get ready to sweat and unleash your inner boxer! This workout focuses on your entire body with interval boxing moves. Put on your gloves and get ready to punch, kick and block your way through this cardiovascular workout! Are you in need of some exercise AND social time? Come join Carolyn for a low impact, but vigorous walk/run! You will exercise your legs, heart and probably your mouth! Please call 610-209-8047 for location, day and time. Create harmony in your body, mind, and spirit! Pilates is a unique system of stretching and strengthening exercises developed over ninety years ago. Pilates strengthens and tones your muscles while improving your posture, flexibility and balance to create a more unified and connected body and mind.